Could reasonably be expected to discharge oil to U.S. navigable waters or adjoining shorelines. Aboveground oil storage capacity greater than 1,320 U.S. gallons, or completely buried oil storage capacity greater than 42,000 U.S. gallons. Intra-facility gathering lines subject to U.S. Department of Transportation’s pipeline regulations; and Underground oil storage tanks at nuclear power generation facilities. On November 5, 2009, the EPA Administrator signed a notice amending certain requirements of the Spill Prevention, Control, and Countermeasure (SPCC) rule in order to address additional areas of regulatory reform that have been raised by the regulated community. The November 2009 amendments revise the December 2008 amendments as a result of EPA's review of comments and consideration of all relevant facts. EPA is either taking no action or providing minor technical corrections on the majority of the December 2008 provisions. However, this action modifies the December 2008 rule by removing the provisions to: exclude farms and oil production facilities from the loading/unloading rack requirements; exempt produced water containers at an oil production facility; and provide alternative qualified facilities eligibility criteria for an oil production facility. Additionally, because of the uncertainty surrounding the final amendments to the December 5, 2008, rule and the delay of the effective date, EPA will propose to extend the compliance date. This rule is effective January 14, 2010. JP Specialties is pleased to have published our final issue of "We Contain More" magazine for 2009. The quarterly publication covers information important to Engineers, Contractors, and Owners of environmental engineered concrete structures. Please click the link and download your copy today. 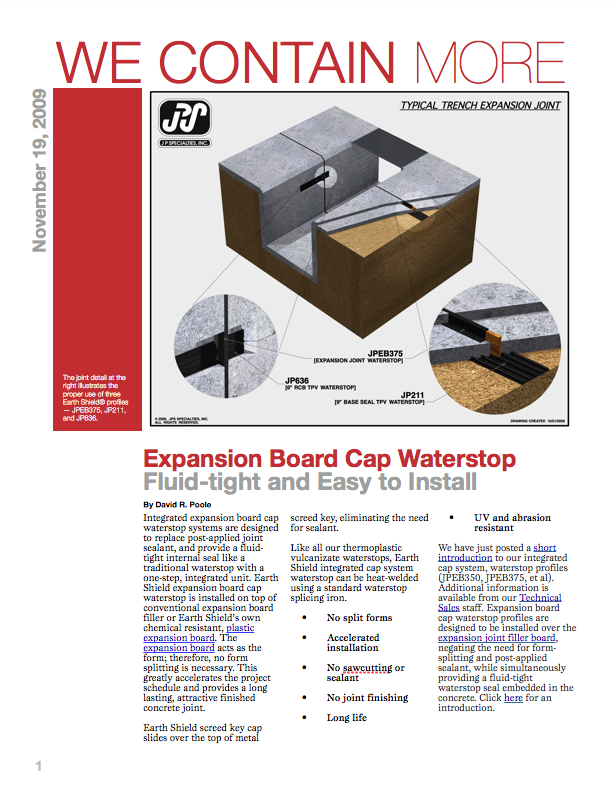 We have just posted a short introduction to our integrated cap system, waterstop profiles (JPEB350, JPEB375, et al). Additional information is available from our Technical Sales staff. 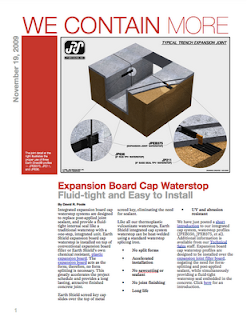 Expansion board cap waterstop profiles are designed to be installed over the expansion joint filler board, negating the need for form-splitting and post-applied sealant, while simultaneously providing a fluid-tight waterstop seal embedded in the concrete. Click here for an introduction. The American Concrete Institute has posted a draft standard of 350.1 — Specification for Tightness Testing of Environmental Containment Structures (ACI 350.1) and Commentary. Per ANSI-approved standardization procedures the Draft Standard is currently open for public discussion. Click on the title to review the draft. JP Specialties, Inc., the leading manufacturer of chemical resistant waterstop (Earth Shield®) and waterstop accessories is proud to sponsor "Rhythm on the Vine", benefiting Shriners Hospital for Children. 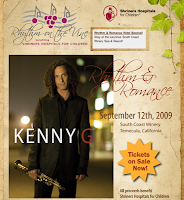 Mark your calender (September 12th, 2009) and join us for a night of smooth jazz with Kenny G at the beautiful South Coast Winery in Temecula, CA. South Coast Winery combines a working winery with luxurious sanctuary—peaceful walks through the vines, winery tours and tastings, gourmet food paired with award-winning wines, vineyard views from a villa terrace with the highest standards of service. A slightly romanticized version of the vintner lifestyle. Located 50 miles north of San Diego and 90 miles southeast of Los Angeles, South Coast Winery Resort and Spa is in the heart of Temecula's Wine Country, part of the Inland Empire Region of Southern California. Driving Directions: From I-15 exit Rancho California Road and travel east approximately 10 miles, through Temecula Wine Country. South Coast Winery Resort & Spa is located at the corner of Rancho California & Anza Roads. 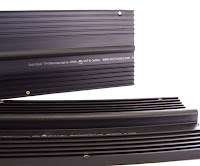 New for 2009, all ribbed Earth Shield Waterstop profiles are available with factory installed brass eyelets. 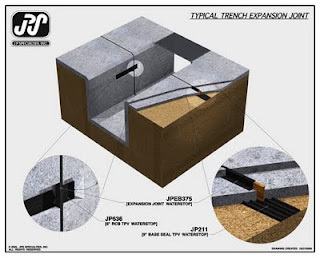 The eyelets provide for a convenient and durable tie-off point for wire tying the waterstop to the steel reinforcement prior to the concrete pour. JP Specialties installs the brass eyelets at 12" centers, between the last two ribs, to provide maximum resistance and rigidity to the poured concrete weight. Note to specifier: To add factory installed brass eyelets to your Earth Shield specification, simply precede the specified part number with "EY." Example: If you are specifying JP636 and want the optional eyelets, call out part number EYJP636. 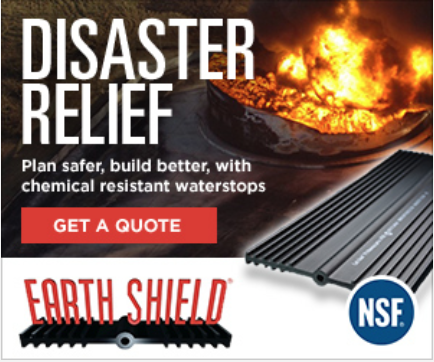 Earth Shield's newest retrofit profile (part no. JP621L) is featured in the July 2009 issue of Concrete International magazine. A direct link to the Special Products & Practices Showcase article can be found here. We appreciate the editorial staff at CI for introducing their readership to our newest innovative product. 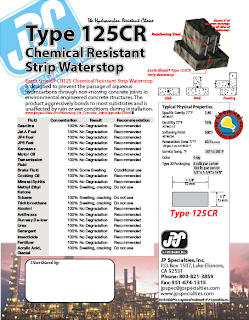 For all users of our products, we have posted in our Tech Library brand new, updated MSDS sheets for all our products. Earth Shield is proud to be a major, critical component in the secondary containment system for the Ruwais Refinery Sulfur Expansion project in the United Arab Emirates. 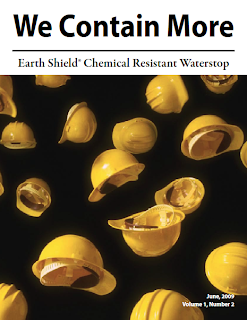 Earth Shield products were chosen for their proven hydrocarbon resistance and long lifespan. A variety of different profiles were utilized on the project including tear web and integrated expansion board cap. 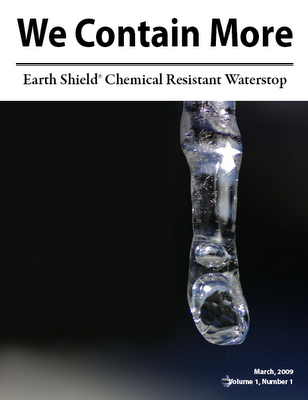 The premier issue of our electronic magazine — We Contain More — is now live and available for download on the www.jpspecialties.com website. The inaugural issue covers the brand new CFR 112 regulations and is recommended to all our engineering and owner clients. Download your free copy today.